In my journey from “fatty to fit” I’m constantly looking for new ways to challenge myself in workouts. Some exercises I’ve tried a time or two and even if they’re fun and interesting and seem to target specific areas, they never seem to stick. Other workouts are so fundamental and so effective across most, if not all muscle groups, that they become central to your workout routine. These are the things that you expect to find in any gym like free weights, bench press, kettle bells, and cable machines. Then there are the accessories that can help you amplify your workouts and bring an extra challenge to basic movements like the physio and bosu balls which allow you to combine weight lifting or body resistance exercises to force additional muscle stabilization which overall gives you a more aggressive and results driven workout. When I first saw someone else using the StrongBoard Balance I instantly wanted to try it. Not only did I want to try it, I imagined how I could add it to every workout. I could see myself using this and couldn’t wait to get one! I could tell that it was adaptable so it would be a good challenge for a beginning level workout but also provide endless options for intermediate and advanced athletes to level up. The StrongBoard Balance amplifies to just about every workout, everything from a basic squat to reinforcing muscle response for athletes in sports like skiing, surfing and gymnastics. This is THE balance board that should not only be in every gym but it’s affordable and portable enough for home. The construction and materials used on the StrongBoard Balance are the highest quality so it promises durability. It “feels” like a commercial piece of gym equipment yet I can afford to own one. I keep it in the trunk of my car along with my music equipment…a few of my favorite things. 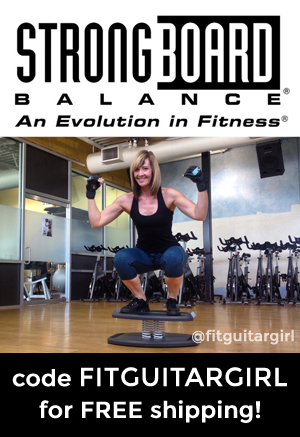 Use code FITGUITARGIRL for free shipping when you purchase at www.strongboardbalance.com. Do Visible Results Matter or is Just “Feeling” Better Enough?